Room Classics - Library — Patricia McLean Interiors, Inc. 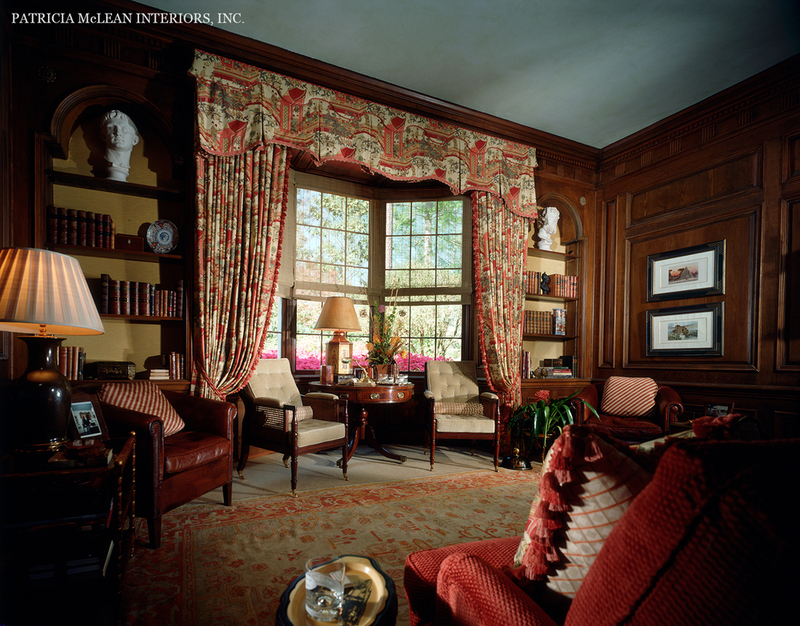 The paneled library, with its Grinling Gibbons-style fireplace and bay window surrounded by tall bookcases, is the heart of the home. An antique Oushak rug, vibrant with terra cottas, creams and golds, is the anchor for the warm chinoiserie linen combed with a crisp taffeta stripe and passementerie that frame the window. Fabrics and trims were all Zoffany. The comfortable English-caned library chairs and cozy club chairs are provided with ample light for reading. An eye-catching tole lamp encourages visitors to inspect a book on an English drum table. The leather club fender at the hearth expands seating when needed. Antique porcelains and busts share the space on the shelves with leather-bound volumes. Italian prints are mounted in hand-finished frames. A period Federal mirror adds sparkle to the mantel.